Chemoembolization; Hepatocellular carcinoma,; Portal vein; Thrombosis; Survival Analysis. Objective: Portal vein thrombosis is considered a relative contraindication for transarterial chemoembolization (TACE) in hepatocellular carcinoma. The purpose of our study was to evaluate the efficacy of TACE treatment in patients with hepatocellular carcinoma with portal vein (PV) thrombosis. Methods: From April 2011 to June 2013, 17 patients with unresectable hepatocellular carcinoma with PV thrombosis were studied. Patients were assessed for tumor response by imaging at regular intervals and the data compared with the baseline laboratory and imaging characteristics obtained before treatment. Univariate analysis was used to assess the treatments impact on patient survival. Survival analysis was performed using Kaplan–Meier estimations. Results: Overall survival rates at three, six and 12 months were 82%, 71%, and 47%, respectively, with a median of 10 months. 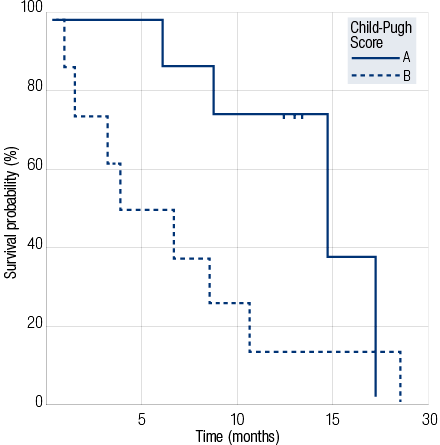 Patients in Child-Pugh class A had a median survival of 15 months compared to five months for those patients in Child-Pugh class B. The median survival period of patients responsive to treatment was 13 months while that of non-responders was five months. Patients with ascites at the time of presentation had median survival period of six months while those who did not had a median survival period of 13 months. In univariate analysis, response to chemoembolization (p<0.001), ascites (p<0.050) and Child-Pugh class at diagnosis (p<0.050) were found to be significant prognostic factors. Conclusion: TACE is a promising procedure in unresectable hepatocellular carcinoma with PV thrombosis. Response to chemoembolization, ascites and Child-Pugh class were the most important determining factors of survival. Portal vein (PV) thrombosis is considered an absolute contraindication to Transarterial Chemoembolization (TACE) treatment by some researchers and a relative contraindication by others. This is because the blood supply to the liver is already compromised due to PV thrombosis, and embolization of the hepatic artery may result in hepatic infarction and/or acute hepatic failure, especially in patients with limited hepatic reserve. In our experience, TACE offered a survival benefit and we recorded no instance of liver infarction or acute liver failure following the procedure when evaluated using computed tomography (CT)/magnetic resonance imaging and biochemistry analysis. This is likely due to collateral circulation and/or PV recanalization, which is often present in patients with lobar PV thrombosis. Several studies including a meta-analysis have shown the increase in overall survival rate of patients with unresectable hepatocellular carcinoma (HCC) with PV thrombosis, which was earlier thought to be an absolute contraindication for TACE.1 A study by Luo et al,2 showed a statistically significant survival benefit in patients with unresectable HCC treated with TACE with cisplatin and iodized oil. The one, two, and three-year survival rates in TACE-treated patients were reported to be 57%, 31%, and 26%, respectively, compared with 32%, 11%, and 3%, respectively, in the control group. In a meta-analysis of randomized controlled trials, Llovet et al3 showed significantly decreased two-year mortality rates in patients treated with TACE, with an odds ratio of 0.53 (95% confidence interval (CI), 0.32–0.89; p=0.017). The objectives of this study were to evaluate the efficacy of TACE in patients with HCC complicated by PV thrombosis, and to study the factors affecting the outcome of the therapy and procedure related adverse events. We also sought to assess patient survival following the procedure. A total of 53 patients with HCC were admitted between April 2011 to June 2013, 17 of which had lobar/branch PV thrombosis and were included in this study. Patients with unresectable HCC proven on triphasic cross-sectional imaging and/or biopsy and satisfying the pre-requisites for TACE were enrolled. All 53 cases underwent pre-treatment evaluation for risk factors of HCC and comorbid diseases. Baseline imaging and laboratory results (including complete blood count, liver function tests, renal function tests and alpha-fetoprotein) were studied and all patients were classified according to Child-Pugh criteria. Patients enrolled in our study had an Eastern Cooperative Oncology Group (ECOG) performance score of between zero and two, and a total bilirubin level of 3mg/dL or less. The study conforms to the provisions of the Declaration of Helsinki (as revised in Tokyo 2004). The study was approved by the Sir Ganga Ram Hospital Research Protocol Ethics Committee. Informed written consent was obtained from patients before enrolment into the study. Exclusion criteria included features of decompensated cirrhosis (Child-Pugh B≥8, and/or jaundice), clinical encephalopathy, refractory ascites or hepatorenal syndrome. Patients with renal insufficiency (creatinine≥2mg/dL or creatinine clearance <30ml/min), marked arterioportal shunting and complete PV thrombosis were also excluded. Technical contraindications to hepatic intra-arterial treatment such as untreatable arteriovenous fistula were also taken into consideration. An 18-gauge single-wall needle was used to access the common femoral artery by the Seldinger technique. A 5-F or 6-F vascular sheath was placed in the common femoral artery over a 0.035-inch guidewire. Under fluoroscopic guidance, a 5-F glide catheter was advanced into the aorta and celiac and superior mesenteric artery (SMA) angiogram was obtained to identify the tumor feeders. The catheter was advanced over the guidewire into the desired hepatic artery branch, depending on the tumor location. Selective catheterization was done using a microcatheter to achieve lobar or segmental embolization of the targeted lesions. A solution containing doxorubicin (up to 75mg) and 5-Flouro Uracil (up to 1000mg) with iodized oil in ratio of 1:1 was infused, followed by the infusion of polyvinyl alcohol particles to achieve complete vessel occlusion. Patients were assessed for tumor response by imaging and biochemistry at three and six months, and then every six months for one year. The data was compared to the baseline readings obtained before treatment. Any adverse events were recorded. Repeat TACE was done if residual tumor was detected or in the event of disease progression. Adverse events developing immediately and within 30 days of the TACE procedure were also recorded, assessed, and graded according to the Common Terminology Criteria for Adverse Events (CTCAE, version 3.0, for toxicities). Kaplan-Meier analysis was used to evaluate patient survival and factors associated with survival. Univariate analysis was performed and statistical analysis was done using Statistical Package for the Social Sciences (SPSS) version 17. In our study group, 16 patients were male. The median age of presentation was 59 years. Seven patients (41%) had underlying cryptogenic liver disease, 24% patients (n=4) had hepatitis-B infection and four patients had hepatitis-C infection. One patient was diagnosed with non-alcoholic fatty liver disease (NAFLD) and one with alcohol induced liver disease. Nine patients (53%) had unilobar disease among which one patient had isolated left lobe disease. Tumors were multifocal in 76% of the patients (n=13). Disease was detected by imaging in 70% of patients (n=12) while the remaining needed both imaging and biopsy for diagnosis (n=5). 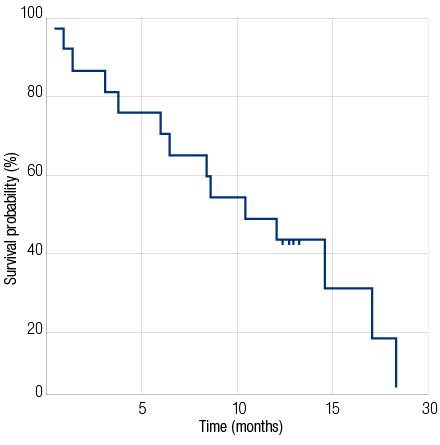 Figure 1: Kaplan-Meier survival curves comparing the survival of patients in Child-Pugh class A and class B groups who underwent transarterial chemoembolization treatment. Figure 2: Kaplan-Meier analysis of overall survival of patients who underwent transarterial chemoembolization treatment. Sixteen patients had a Child-Pugh class A or class B contained (n=8 in each group). One patient belonged to Child-Pugh class C. All patients in our study group except one had associated cirrhosis of the liver. Ascites were present in 47% patients (n=8). Among our patients mean serum total bilirubin level was 1.5mg/dL (range 0.5–3) and mean serum albumin level was 3.2mg/dL (range 2-4). Pre-procedure aspartate transaminase (AST) levels ranged from 39 to 146 (mean, 76) and alanine aminotransferase (ALT) levels ranged from 10 to 71 (mean, 46). Blood alpha-fetoprotein (AFP) levels were raised in 76% of the patients (n=13). Almost all patients (n=16) had portal hypertension and arterio-portal shunting of blood was seen in three patients. Following TACE, the grades of toxicity (G-score) were assessed for biochemical parameters. For serum total bilirubin, 17% patients (n=3) had a G-score of three and two while 64% (n=11) had a G-score of one. Only one patient with low serum albumin had a G-score of three while 53% (n=9) had a score of two and 41% (n=7) had a score of one. Grades of toxicity score for hepatic enzymes were one in 64% of patients (n=11) for AST, and 76% of patients (n=13) for ALT. Two patients (11%) had a G-score of two for AST while none had a G score of two for ALT. Four patients (24%) had a G-score of three for both AST and ALT. The most common post-embolization clinical complication encountered was fever and was seen in 35% patients (n=6) followed by pain, recorded in 17% patients (n=3). One patient had vomiting and one had systemic bacterial peritonitis. Following TACE, the range of survival was 0.5 to 19 months. The survival rate at the end of three months following the procedure was 82%. The survival rate six months after the procedure was 71%, and 47% after one year with an overall median survival rate of 10 months. Patients in Child-Pugh class A had median survival of 15 months while those in class B had median survival period of five months (p<0.050) [Figure 1]. Patients with an initial tumor size less than 10cm had a median survival of 12 months, whereas patients with tumor size more than 10cm had a median survival of five months (p=0.098). Patients who had no ascites at the time of presentation had better survival rates with a median of 13 months compared to those presenting with ascites with median survival period of six months (p=0.020). Patients with progressive disease at three months had a median survival period of five months while responders at this point had a better survival rate with median survival period of 13 months (p<0.001) [Figure 2]. At six months, responders had better survival rates than non-responders with median survival period of 13 months compared to non-responders who had median survival period of eight months (p<0.001). Figure 3: Computed tomography (CT) angiography images from a 62-year-old male patient with right portal vein (PV) thrombosis; (a) CT indicates areas of arterial enhancement* representing HCC, and a peripherally calcified lesion anterior to HCC suggestive of a calcified hydatid (red arrow), (b) Right PV thrombosis (red arrow), (c) Catheter angiography image showing areas of tumoral blush (red arrow) and enhancing tumor thrombus in PV (blue arrow), (d) Post-embolization image showing no residual blush in the tumor with lipidiol deposition (*), (e, f) CT angiography after one year shows absence of arterial enhancement with lipidiol deposition(*) and non-enhancing PV thrombus (red arrow). Various treatment options are available to treat unresectable HCC. According to the AASLD guidelines, advanced HCC with PV thrombosis can only be treated with sorafenib-targeted therapy.4 But a more recent study by Pinter et al,7comparing the efficacy of TACE and sorafenib in patients with advanced-stage HCC (Barcelona Clinic Liver Cancer stage C) suggested a promising outcome with TACE. However, PV thrombosis is still considered an absolute contraindication for TACE in current practice, since blood supply to liver is already compromised due to PV obstruction and TACE can further compromise arterial supply potentially resulting in hepatic infarction or acute hepatic failure. We used TACE for disease control in patients with unresectable HCC with partial or lobar PV thrombosis, and no cases showed features of hepatic infarction or acute liver failure. The theoretical explanation to this could be formation of collateral circulation and/or PV recanalization as also postulated by Georgiades and colleagues,8 in their study. We kept the patient selection, TACE procedure, and follow-up imaging modality and interval similar in all patients to minimize bias. Our study has shown a promising role for TACE in patients with PV thrombosis. The survival rate at the end of three months following the procedure was 82%. Overall survival rate at six months following the procedure was 71% and after one year was 47% with median survival rate of 10 months. Our results were better than those obtained by Georgiades et al8 where the response rate was 42%. The median survival of their group was 6.2 months, and the three, six, 12, and 18-month survival rates were 92%, 54%, 22%, and 14%, respectively. A comparison of the results obtained in our study to previous studies can be seen in Table 1. Table 1: Comparison of mortality, response rates, and median survival time among various studies. PV thrombosis is one of the most common poor prognosis factors and a contraindication for TACE treatment. Few studies have shown that TACE-treated patients have a better survival rate compared to patients that did not have TACE treatment. Lee et al,12 reported that the median survival of patients with HCC and main PV thrombosis treated with TACE was 150 days (five months) and the three, six, and nine-month survival rates were 74%, 36%, and 23%, respectively, compared to a median survival of 90 days (three months) for patients without treatment with survival rates at three, six, and nine months 44%, 25%, and 13%, respectively. Chung et al11 also reported that the median survival of patients with HCC and main PV invasion in the TACE group was longer than the median survival in the supportive care group (5.6 months vs. 2.2 months). In our study, 17 patients with HCC and PV thrombosis had TACE treatment and the median survival was 312 days (10 months), and the three, six, and 12 month survival rates were 82%, 71%, and 47%, respectively. These patients showed better cumulative survival rates without major complications. Hepatic infarction is the most common complication, because of which TACE is not advocated in patients with PV thrombosis. However, in our study no such complication was noted. Most common post-embolisation clinical complication encountered was fever followed by pain, vomiting, and systemic bacterial peritonitis, which were all managed conservatively. Only four patients had transiently raised AST and ALT levels and bilirubin was raised in only three patients. There were no major complications related to TACE such as liver failure, 30-day mortality, or encephalopathy. In the study by Chern et al,13 toxicity was graded and there were no adverse events greater than grade II. The main adverse events were grade I and II and included fever (80%), abdominal pain (68%), and nausea and vomiting (72%). Three months after the procedure, among the 13 patients that survived, none showed partial response. While 85% of patients showed stable disease and 15% patients showed progressive disease. Follow up after six months showed that 60% of the survivors were responders with 40% patients showing stable disease. At this point 40% of patients showed progressive disease. At 12-month follow up, 33% patients were non-responders, while among the responders two patients showed partial response and stable disease. The effectiveness of TACE was better shown when patients with progressive disease at the end of three months had a median survival period of five months while responders at this point had a better survival rate with median survival period of 13 months (p<0.001). Patients who responded to therapy at the end of six months had median survival of 13 months while that of the non-responders was eight months (p<0.001). Various prognostic factors were studied, like tumor size, ascites, Child-Pugh score, and liver enzymes. Studies have proved that smaller tumors show better response, as found in our study. Patients with an initial tumor size less than 10cm had a median survival rate of 12 months whereas patient with tumor size more than 10cm had a median survival of five months. However, this was not a statistically significant predictor of outcome (p=0.098). Our study showed that patients with no ascites at the time of presentation had better survival rates than those who had ascites with a median of 13 months compared to those presenting with ascites that had a median survival period of six months (p <0.050). Child-Pugh score was the best prognostic factor. Patients in Child-Pugh class A had median survival of 15 months compared to those in class B with a median survival period of five months (p<0.050). Technically, the procedure was considered accurate in all cases. Following TACE, lipiodol deposition was seen in the tumor area and decrease in the tumor blush seen in all patients, suggestive of technical success. No procedure related complications like arterial dissection, aneurysm formation, or access site hematoma were reported. This study faced certain limitations. First of all, it was a retrospective study and not a randomised control prospective study, which led to bias. Secondly, the sample size was too small to accurately postulate the benefits of TACE in patients with PV thrombosis. In conclusion, TACE is a promising procedure for patients with unresectable HCC and PV thrombosis. Response to chemoembolization, Child-Pugh class at diagnosis, and ascites at the time of presentation were the most important determining factors of survival following TACE. However, a prospective study with larger sample size is necessary to establish the potential of TACE in treating HCC complicated with PV thrombosis. The author declared no conflict of interest. No funding was received for this work. Special thanks to Dr. Saxena for his valuable suggestions and moral support. We would like to acknowledge Mr Yudhvir, Mr Sunil, Mr Arun and Sister Leena for their hard work and dedication. Xue TC, Xie XY, Zhang L, Yin X, Zhang BH, Ren ZG. Transarterial chemoembolization for hepatocellular carcinoma with portal vein tumor thrombus: a meta-analysis. BMC Gastroenterol 2013;13:60. Luo J, Guo RP, Lai EC, Zhang YJ, Lau WY, Chen MS, et al. 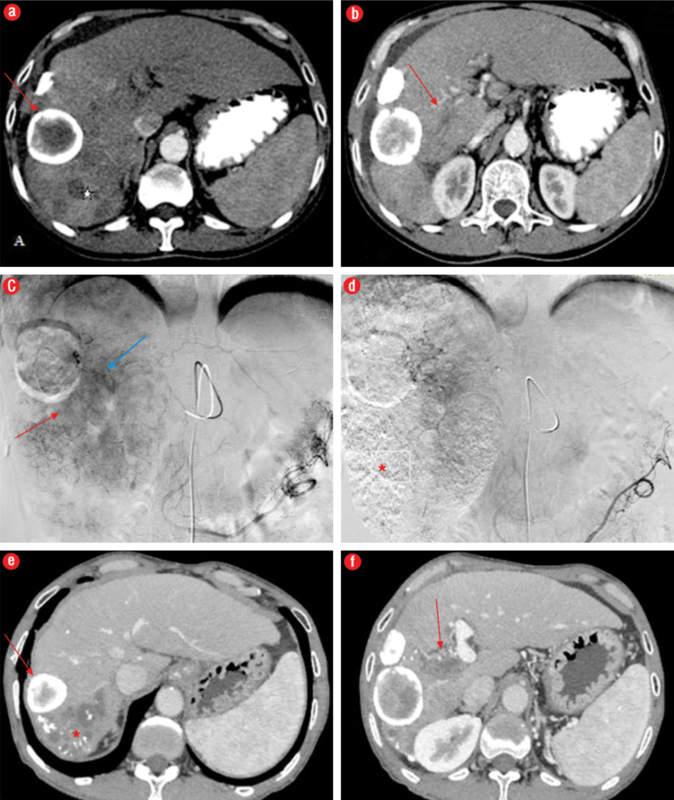 Transarterial chemoembolization for unresectable hepatocellular carcinoma with portal vein tumor thrombosis: a prospective comparative study. Ann Surg Oncol 2011 Feb;18(2):413-420. Llovet JM, Bustamante J, Castells A, Vilana R, Ayuso MdelC, Sala M, et al. Natural history of untreated nonsurgical hepatocellular carcinoma: rationale for the design and evaluation of therapeutic trials. Hepatology 1999 Jan;29(1):62-67. Bruix J, Sherman M; American Association for the Study of Liver Diseases. Management of hepatocellular carcinoma: an update. Hepatology 2011 Mar;53(3):1020-1022. Llovet JM, Ricci S, Mazzaferro V, Hilgard P, Gane E, Blanc JF, et al; SHARP Investigators Study Group. Sorafenib in advanced hepatocellular carcinoma. N Engl J Med 2008 Jul;359(4):378-390. Villa E, Moles A, Ferretti I, Buttafoco P, Grottola A, Del Buono M, et al. Natural history of inoperable hepatocellular carcinoma: estrogen receptors’ status in the tumor is the strongest prognostic factor for survival. Hepatology 2000 Aug;32(2):233-238. Pinter M, Hucke F, Graziadei I, Vogel W, Maieron A, Königsberg R, et al. Advanced-stage hepatocellular carcinoma: transarterial chemoembolization versus sorafenib. Radiology 2012 May;263(2):590-599. Georgiades CS, Hong K, D’Angelo M, Geschwind JF. Safety and efficacy of transarterial chemoembolization in patients with unresectable hepatocellular carcinoma and portal vein thrombosis. J Vasc Interv Radiol 2005 Dec;16(12):1653-1659. Yamada R, Sato M, Kawabata M, Nakatsuka H, Nakamura K, Takashima S. Hepatic artery embolization in 120 patients with unresectable hepatoma. Radiology 1983 Aug;148(2):397-401. Okazaki M, Higashihara H, Koganemaru HE. Transcatheter arterial embolization for inoperable hepatocellular carcinoma. Jpn J Clin Radiol 1991;36:535-539. Chung JW, Park JH, Han JK, Choi BI, Han MC. Hepatocellular carcinoma and portal vein invasion: results of treatment with transcatheter oily chemoembolization. AJR Am J Roentgenol 1995 Aug;165(2):315-321. Lee HS, Kim JS, Choi IJ, Chung JW, Park JH, Kim CY. The safety and efficacy of transcatheter arterial chemoembolization in the treatment of patients with hepatocellular carcinoma and main portal vein obstruction. A prospective controlled study. Cancer 1997 Jun;79(11):2087-2094. Chern MC, Chuang VP, Liang CT, Lin ZH, Kuo TM. Transcatheter arterial chemoembolization for advanced hepatocellular carcinoma with portal vein invasion: safety, efficacy, and prognostic factors. J Vasc Interv Radiol 2014 Jan;25(1):32-40. Therasse P, Arbuck SG, Eisenhauer EA, Wanders J, Kaplan RS, Rubinstein L, et al. New guidelines to evaluate the response to treatment in solid tumors. European Organization for Research and Treatment of Cancer, National Cancer Institute of the United States, National Cancer Institute of Canada. J Natl Cancer Inst 2000 Feb;92(3):205-216.